What Makes GrandPrix Different Than Other Two-Post Lifts? 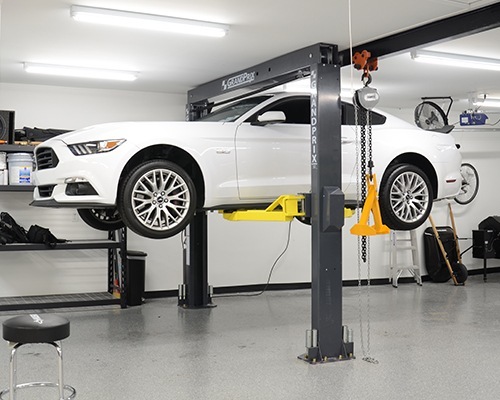 When mechanics think of the best two-post lifts, they think of professional-grade pieces of equipment that are made for auto service shops and high-rise garages. If you're like many seasoned technicians who want a lift but don't think one will fit in their garage, the alternatives are either low-rise lifts or a floor jack and jack stands. Without exaggeration, we can say that the GrandPrix is the first and only two-post lift to offer the low-profile benefits of a scissor lift with the working comfort of a full-rise lift. And it's the only lift in its class that lets you finally abandon those floor jacks and stands. There's never been a two-post design capable of disrupting the entire industry, until now. The GrandPrix series is the first to fit in virtually any space with ceilings as low as 9 feet. This means the GP-7LCS (our shortest model) is almost certain to fit in your garage. Of course, if you have more room to spare, we make two models that offer a little more working space: the standard GP-7 for 13-foot ceilings and the low-clearance GP-7LC for 10-foot ceilings. Naturally, there’s a bit of a trade-off between the overall height of a car lift and its max lifting height. The taller the lift, the more standing room underneath. GrandPrix has a smaller footprint than typical two-post structures, but it offers an incredible amount of headroom relative to its size. For all intents and purposes, a GrandPrix does everything your local shop mechanic’s ultra-tall car lift does. It simply does it in a smaller space. GrandPrix isn't just for homeowners. Its small size and versatility make it perfect for professional shops. Reduced-width side posts cut out a full two feet of steel compared to other two-post designs. That's two whole feet of open space instead of bulky, space-consuming steel! For shops without zero room to spare, this means more lifts can be installed in less space. More lifts mean more customers and higher profits. When we talk about slimmer side posts, you may be thinking, “There’s no way you can take out steel from the side columns and tell me this lift is as safe as thicker, wider models.” It's funny, because somewhere along the line, that’s what the public has been led to believe. The truth is that all ALI/ETL Certified side columns, including the “thin” columns on the GrandPrix, must be tested to support 300% of the load on any given component. The GrandPrix is not granted an exception to this rule. Many two-post lifts feature a single wire rope that helps equalize the lifting arms and/or assist the hydraulics in lifting the carriage. Likewise, four-post lifts feature two such ropes. With the GrandPrix, we’ve done what no other lift has offered before. We took the design concept of a four-post (two wire ropes) and routed both throughout the structure. This effectively creates a redundant lifting rope, which doubles the GrandPrix's safety factor. In essence, the GrandPrix has twice as many wire ropes it needs in order to be ALI/ETL Certified. In a completely unlikely hypothetical situation, if one rope were to suddenly snap and lose tension throughout the lift, the other would still be there, and you wouldn’t know the difference. The lift would keep on lifting. Again, ALI/ETL Certification doesn’t require us to do this, but we’re never ones to shy away from over-engineering everything. 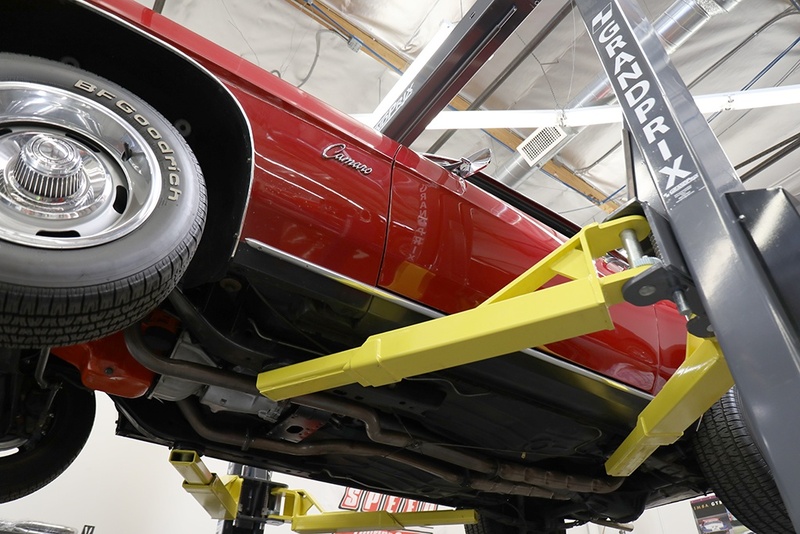 As part of standard ETL testing, trained inspectors are required to “break” every car lift they certify to ensure that it holds up under all but the most extreme and dangerous circumstances. This means overloading the lift well beyond the 300% threshold. The GrandPrix’s design is so unique that during testing, ETL couldn’t figure out a way to “break” our structure. We actually had to have one of our own engineers “un-engineer” the lift to break both wire ropes at the same time. The result: the lift dropped two inches and caught on the locks, just like it should. 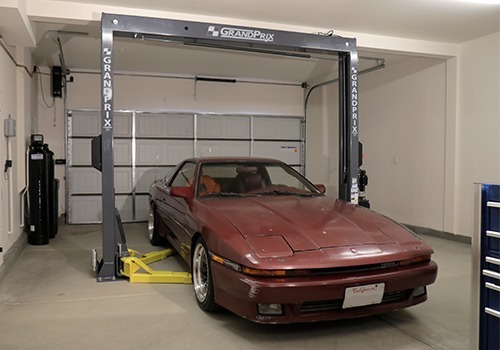 Not only does the GrandPrix look awesome and take up less space than any two-post lift you’ve ever seen, it’s as safe as any car lift ever made.